We premiered this brilliantly hued salad a couple of weeks ago at US Botanic Garden in Washington DC, amid a beautiful array of flowers in the garden atrium. Kids and adults swooned over the colors of salad, captured here by one of garden volunteers, Alice Mann. With the uncommon combination, the flavors were great too. Makes a good potluck — don’t mix the almonds in until you get to your destination as they will get a bit soggy, and we always bring extra to serve on the side. To cook the beets: place the unpeeled beets in a medium saucepan, and cover them with water. Bring to a boil, reduce heat and simmer until fully cooked, about 45 minutes, or until a knife inserted indicates they are tender. Preheat the oven to 350. In a small bowl, toss the almonds with the maple syrup and sugar. Spread them evenly on a parchment-covered baking sheet and bake, tossing the nuts every 5 minutes to keep them from sticking and to distribute the sugar, until caramelized 10-20 minutes. Set aside to cool. Remove skins from the beets, cut into large dice (cubes), place them in a salad bowl. Cube the tomatoes and watermelon, add them to the beets. Whisk together the balsamic vinegar and the olive oil, toss the salad. Sprinkle generously with salt and pepper. Serve sprinkled with the almonds, garnish with chopped mint. Serves 6-8. 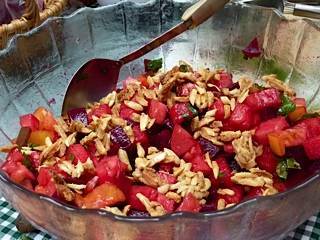 This entry was posted in Recipes from Danielle's pantry, Salads, Sides, Vegetarian and tagged almonds, beets, mint, tomato, vegetarian, watermelon. Bookmark the permalink.